Unlike really small watercraft, a cruise boat requires a home base – a mooring on the water. 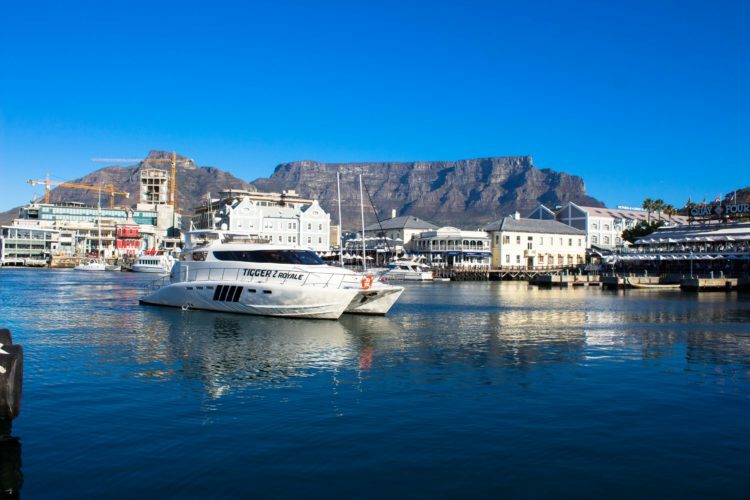 Our Tigger 2 Royale cruise boat’s home base is the V&A Waterfront in Cape Town. This fair Cape, its history, and heritage are closely linked to the city’s developments. One can only imagine what a welcome sight Table Bay must have been for the early Dutch sailors, journeying along the spice route to and from Europe to the Dutch East Indies (Java and Batavia), loaded with fragrant, flavourful commodities that were so precious to Europeans. It’s interesting to note that pepper was one of the scarcest, most sought-after, precious and costly spices among upper classes in Europe, hence the origin of the Afrikaans word “peperduur” (as expensive as pepper). The sailors’ delight at safely entering Table Bay must have been palpable, particularly once van Riebeeck established a settlement, primarily for the purpose of supplying passing company ships with fresh provisions and water. Other than the naturally sheltered bay, there were initially no waterfront developments of any significance, only a jetty, built by van Riebeeck’s men in 1654, two years after he arrived in the Cape. More than a century later, in 1793, when Britain and France were at war, both countries sought to occupy the Cape because of its strategic value as a route to the lucrative East Indies. Britain prevailed, occupying the Cape in 1795 and ending Dutch dominion. Shipping relied on Table Bay’s natural defences for protection from storms until 1858, when over 30 vessels in the bay were wrecked during severe storms. Lloyds of London refused to grant further cover to ships at anchor in the Cape. Queen Victoria’s son, Alfred, a RN midshipman in 1860, symbolically dumped the first load of stone to commence construction of a breakwater, creating the Alfred Basin, the first step in establishing a harbour in the Cape. After the discovery of diamonds and gold in South Africa, shipping volumes in the Alfred Basin increased, requiring additional harbour facilities, resulting in a harbour extension – the Victoria Basin. Very much later, in 1988, the Victoria & Alfred Waterfront (Pty) Ltd was established to redevelop and upgrade both basins and the surrounds, creating the V&A waterfront and its world-class, mixed use areas. It was an instant hit with residents, visitors, and tourists, likewise our Tigger 2 waterfront boat cruise guests. Tigger 2 adds a wow factor to the waterfront, and we’d love to include you on our list of passengers for our luxury boat cruises.